Kimi Raikkönnen wins the Australian GP in Melbourne ahead of Alonso and Pole setter Vettel. Raikkönnen was driving unobtrusive through the whole race. The key for his win was the 2 stop strategy, nearly everybody was on 3 stop strategy because their tires lost more grip. Alonso and Vettel were on a 3 stop strategy. Alonso had a better pace then Vettel, that why he could drive to 2nd. The driver of this race was clearly Massa. I was surprised by his pace during the race, he was even faster than his teammate Alonso. Massa had 4th postion as result. Hamilton had a good start, but started to struggle with his car and lost positions through the race- P5 was the result. His teammate Rosberg had more bad luck. Rosberg was on 6th position till his engine gave up the ghost. But the W04 is better than the last years car and Mercedes has a good base. This car has much potential and i think there’s more to come. Button had a difficult race with a difficult car. He managed to bring his car into the points, in 9th, but McLaren has a lot of work to do if they want to keep up with the front runners. Perez race ended in 11th, outside the points but still with an solid debut with McLaren. Williams has even more problems than McLaren with their FW34. Maldonado crashed out, not having a good start to the season. Rookie Bottas completed his race in 14th, but the most important thing is that he managed to stay on the road. Webber started the race in 2nd place and ended it 6th position and why? Yes you have guessed right, he made an awful start and lost a couple of places. He was driving unobtrusive through the GP and maybe he’s last in Australia. 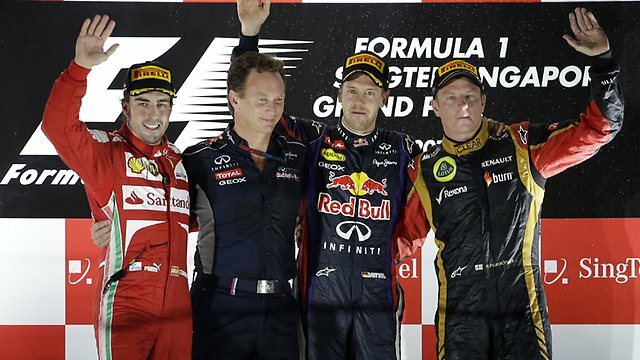 Ricciardo had to retire his Toro Rosso in 12th position. We had many overtakes with many different drivers having a chance to win the race. Sutil had an amazing drive in his first race after Sao Paulo 2011. He was even leading the race for a short amount of time, but this were his very first leadkilometres in his career. We didn’t had many incidents in this race, we didn’t even had any contact going on at the start (Grosjean learned his lesson). We had a fantastic race with three world champions on the podium. The next race is only in one week, the Malaysian GP in Kuala Lumpur. The Qualifying in Melbourne was full of thrills and spills, delay after a delay and super slow motions from marshals brushing the water of with a broom. After an 30 min delay, Q1 was getting under way. But the first drivers struggled already. Hamilton had no grip with his Mercedes. He spun out after turn 2 and damaged his rear wing. The Caterham lads, Van Der Garde and Pic destroyed both their frontwings. Massa crashed heavily later in turn 14, Gutierrez also crashed there later at the exact same place- result for both: no front wing. Webber, Maldonado, Perez and Di Resta were caught out by the rain but managed to not damage their cars. Vergne was very fast and very consistent, but Rosberg was setting the fastest time. Then Q1 was over and we were heading towards Q2, but after nearly 40 min of delay, the race stewards confirmed that they will delay Qualifying till tomorrow at 11:00 am.